On this page, I’ll be describing (following our recent paper; experts, see also our technical website) what can happen if the newly discovered Standard Model-like Higgs particle can decay to a pair of particles which have spin one (the same spin as for a Z particle), and which then in turn each decay to two known particles, typically quarks or leptons. I’ll point out the searches that we think are very promising even now, using existing Large Hadron Collider [LHC] data, and in the near future, when the LHC starts running again in 2015. In fact, we’ll see that even theorists with access to only a few published plots of the data can put very strong limits on this scenario, though only for a part of the range for the mass of the spin-one particles. A discovery in this channel using existing data remains possible! Symbols: “b” = bottom quark, “τ” = tau lepton, script “l” = electron or muon, “μ” = muon, “e” = electron, “γ” = photon, “g” = gluon. The new spin-one particle ZD to which the Higgs is assumed to decay is a “singlet”: a field and/or particle that is not affected by the known non-gravitational forces: the electromagnetic, strong nuclear, and weak nuclear forces. Branching fraction: If you make a Higgs particle, the probability that it decays to two photons is called “the branching fraction for h → γγ”, or “Br(h→ γγ)”. a new non-abelian force [i.e., a force like the nuclear forces] that is made-short range [similar to the weak nuclear force] by a Higgs-like field. In this case there may be multiple spin-one particles with different masses. a new non-abelian force that is made short-range by effects of its own large strength [i.e., roughly like the strong nuclear force, but with some differences.] In this case the new spin-one particles are composite [similar to the hadrons, in particular the rho meson, but much longer-lived]; there may be more than one type. New forces of these types commonly arise in models that were invented to elucidate, indirectly or directly, the nature of dark matter; this includes hidden valleys of various types, and specific models aimed at explaining data from PAMELA, ATIC, AMS, and other experiments that indicate an excess of high-energy positrons [i.e. anti-electrons] raining down from space. Fig. 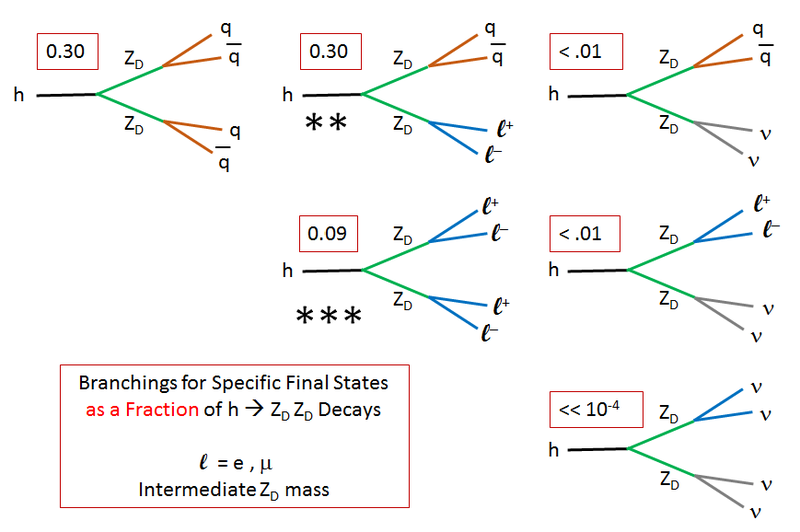 1: A ZD particle’s probability to decay to various types of particles, as a function of its mass, assuming its decays occur through “kinetic mixing” with the photon and Z particle (strictly, with the hypercharge boson.) “Light hadrons” refers to hadrons containing only up, down and strange quarks; in the left plot e and μ are collectively referred to with a script “l“. Calculations in the pink-shaded areas are not trustworthy due to mixing with charmonium and bottomonium states. Because the Higgs field H has dimension 1 and its square has dimension 2, fundamental scalar fields S can interact with it at the renormalizable level, for instance (in the case of a complex scalar) via the interaction ξ|H|² |S|². Suppose the field S is charged under a new force with its own spin-one photon-like or gluon-like particles ZD. Then if S, like the Higgs field itself, develops a non-zero average value, it will give mass to those spin-one particles, and the S particle will be able to decay to a pair of ZD‘s if the masses of those particles don’t forbid it. But also, S will also mix with the Higgs field ZD, and this will allow the Higgs itself to decay to a pair of ZD, if the mass of the latter is less than ½ mh = 63 GeV/c2. In this case, if the ZD mass is somewhat greater than 10 GeV/c2, the pattern of decays is approximately as shown in Figure 2, for the numbers in the red boxes. [Be sure to interpret this properly! If h → ZD ZD has a branching fraction of 0.03, then the branching fraction of h → ZD ZD → two lepton/anti-lepton pairs is 0.03 × (0.09) = 0.0027 . Also note that a lepton here means an electron or a muon, but not a tau, which is much harder to observe.] If instead the ZD mass lies between 4 and 10 GeV/c2, then the decays involving quarks are slightly reduced and those involving leptons are slightly increased. For masses below 4 GeV/c2 the leptonic rates increase further, see Figure 1. In all cases, the easy-to-observe decay to two lepton/anti-lepton pairs occurs in about 10% or more of the h → ZD ZD decays. This is by far the best decay mode in which to search for h → ZD ZD. Fig. 2: Pattern of decays if h → ZD ZD and ZD → quarks and leptons almost proportional to their electric charges, see Figure 1. Numbers shown assume the ZD mass is in the 20 GeV/c2 range. Multiply the numbers shown by the branching fraction for h → ZD ZD to get the Higgs branching fractions. The decay entirely to leptons is extremely promising in existing data (marked with three asterisks) and the decay to two leptons and quarks seems somewhat promising as well. Decays involving leptons and neutrinos will be discussed separately in a later article. 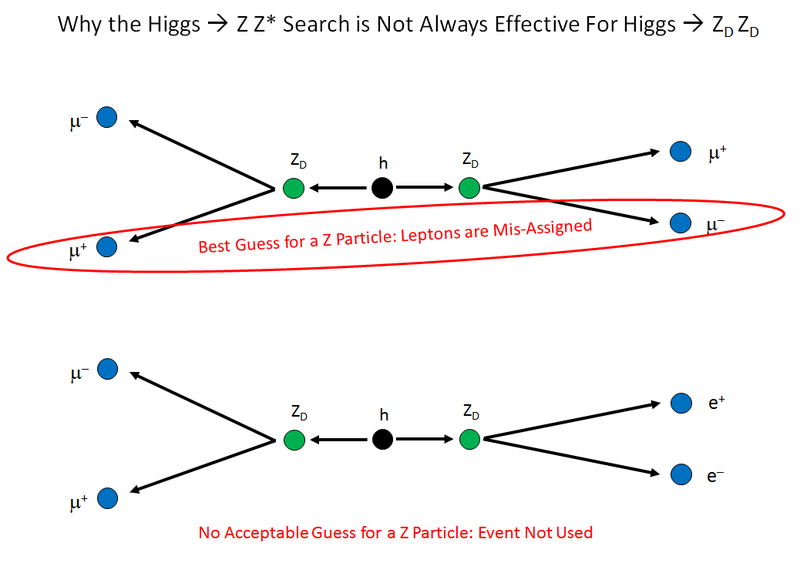 The Standard Search for the Higgs Is Not Optimal! Not only is this decay easily observable, some of the data appropriate for a search for this decay has been made public by the ATLAS and CMS experiments. Indeed, since the Higgs particle was discovered in part through events with two lepton/anti-lepton pairs, one might immediately wonder why such decays are not obviously ruled out by the fact that the search for the Higgs in these types of events revealed nothing unexpected. If the ZD mass is well below 60 GeV/c2, and all four leptons are muons and anti-muons (or all four are electrons and anti-electrons), then it is nearly inevitable that the lepton and anti-lepton whose invariant mass is closest to the Z mass come from different ZD particles. As a result, the leptons and anti-leptons are paired incorrectly, and the fact that the correct pairs have equal mass is lost. The events are distributed smoothly rather than peaked; some events are discarded. If the ZD mass is below 40 GeV/c2 (50 for ATLAS), and the event contains one muon/anti-muon pair and one electron/anti-electron pair, then neither pair forms an acceptable candidate for a Z particle, and the event does not enter the h → Z Z* analysis at all! Fig. 3: How the search for a Standard Model Higgs decaying to two lepton/anti-lepton pairs by h → Z Z* misses the h → ZD ZD signal. Top: if the leptons are all muons or all electrons (and their antiparticles), then the attempt to reconstruct a Z particle mis-pairs the leptons. Bottom: if the leptons include both muons and electrons, then the attempt to reconstruct a Z from the muon/antimuon pair will fail, as will the attempt using the electron and positron, if the ZD mass is below the cut applied in the standard search. Nevertheless, we are able to obtain limits on this process from existing published data. 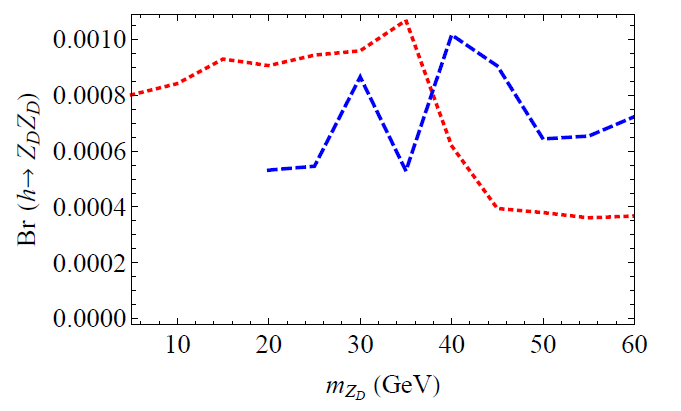 For ZD mass between 40 and 62 GeV/c2, we can use the published CMS data on events, because those containing one μμ pair and one ee pair have the leptons correctly paired. For all masses, we can use the fact that many of the mis-assigned 4e and 4μ events appear in CMS published data. Although they are in the “wrong” place, smoothly distributed instead of peaked, we would still notice their presence if they were abundant. These considerations give the red curve in Figure 4. For masses down to 20 GeV/c2, we can use data from ATLAS from a search for two lepton/anti-lepton pairs where no attempt was made to search for the Higgs but where the invariant masses of the two pairs were compared. Again the leptons in some events are often mis-paired, but ee μμ events would give a peak. The resulting estimated limit is the blue curve in Figure 4. From these two searches, the limit on h → two lepton/anti-lepton pairs is between 10-4 and 10-5, so (using Figure 3) the limit on h → ZD ZD is between 10-3 and 10-4. Fig. 4: Our estimated limits (95% confidence) on the branching fraction for h → ZD ZD from existing published data, as a function of the ZD mass. Red: limits arising from the CMS search for h → Z Z*; limits below 40 GeV are dominated by contributions to the signal from mis-paired leptons. Blue: limits from ATLAS data on the invariant masses of lepton-antilepton pairs in four-lepton events with limited assumptions about their source. A dedicated search for h → ZD ZD should do significantly better. Finally, for masses below 3 GeV/c2, there is a published search from CMS for two equal mass objects that each decay to μμ. (This extends, more weakly, to 5 GeV/c2 in an earlier search. I will discuss these and other low-mass searches in a later article.) At low masses, the branching fraction of ZD to decay to a lepton/anti-lepton pair is even larger, and since no candidate events are observed, strong limits of about 10-4 are found on h → ZD ZD. Both because many events have mis-assigned leptons and because there is no published data between 3 and 20 GeV/c2, it seems likely that ATLAS and CMS, with a dedicated search for h → ZD ZD, could do much better than our estimates. Especially in the gap between 3 and 20 GeV/c2, the possibility of a discovery in this mode even in 2011-2012 data remains very real. Two other applications of the four-lepton data are worth a mention. The first is h → Z ZD where both the Z and ZD decay to a lepton/anti-lepton pair; this happens typically in 0.02 or more of h → Z ZD events. The second is h → Z a where a is a pseudo-scalar (see this page for more on scalars and pseudo-scalars to which the Higgs may decay) that occasionally decays to μμ. For sufficiently large ZD mass, we can use existing data to estimate limits using h → Z Z* data. These limits on h → Z ZD are quite good, reaching about 0.002, because for this signal the strategy of reconstructing a Z particle correctly assigns the leptons, in contrast to a search for h → ZD ZD (Figure 3.) However, there are indirect limits on h → Z ZD from other (electroweak) precision measurements, and these are still a few times stronger than any limits that likely can be obtained from measurements using current LHC data. Only with future data will such a search become competitive with the indirect limits. In a revision of our paper, we have concluded this statement is not correct. One of our sources for limits from electroweak precision measurements was not sufficiently precise. The effect is that the true limits are weaker, and that searches in current data would be competitive with indirect limits, at least for a ZD heavier than 10 GeV/c². On the other hand, data is not available for us to put limits on h → Z a where the a has a mass below about 10 GeV/c2. A search for a low mass muon/anti-muon resonance in the presence of a (candidate) leptonically-decaying Z particle appears well-motivated. If the processes above can be reversed, i.e. if the LHC can indeed produce a Higgs boson which in-turn decays back elementary particles, then why is there a need for the time variable? Is it not more accurate to express the equations by space (x,y,z) and velocity ratios of the resonances (particles)? Higgs decay to unknown spin-one particles which have direct related to chemicals industry. With the help of this article we acknowledge the working detail of police which is very sound good and very impressive. I want to get a site for order resume online and at the same time i found a lot of great site. Happy to get this one.